This year has seen some great progress for the OpenNebula project, with the release of the most advanced and flexible enterprise-ready cloud management tool, and the continued growth of an active and engaged open-source community. As 2010 draws to and end, we’d like to review what this year has meant for the OpenNebula project and give you a peek at what you can expect from us in 2011. As part of the OpenNebula Orion release in October we also opened our internal QA & testing procedures to the community. During 2010, we were very happy to announce that OpenNebula is being enhanced in several flagship international projects in cloud computing, such as StratusLab, aimed at bringing cloud and virtualization to grid computing infrastructures; BonFIRE, aimed at designing, building and operating a multi-site cloud-based facility to support research across applications, services and systems targeting services research community on Future Internet; and 4CaaSt, aimed at creating an advanced PaaS Cloud platform which supports the optimized and elastic hosting of Internet-scale multi-tier applications. These collaborations with world-leading industrial and academic organisations in cloud computing consolidated OpenNebula’s position at the cutting edge of cloud computing technology worldwide. We have also continued our collaboration with the most demanding users of cloud computing management tools that are using OpenNebula to manage several tens of thousands of virtual machines. This is a very good opportunity to acknowledge our active and engaged community, if OpenNebula has gotten so far, it is in no small measure due to the many users and organizations in our community who have actively contributed to the project. In February, we created a new OpenNebula.org site, a new place for the community to share resources, contribute developments and discuss about components and solutions around OpenNebula. We defined the different ways to contribute, from using the technology and spreading the word to contributing fixes and developing new functionality. We also established the OpenNebula Ecosystem in order to promote the different tools, extensions and plug-ins that are available to complement OpenNebula from a wide variety of projects, companies, and research centers. Many new useful components by leading companies and research groups have been added to the ecosystem catalog. The first edition of the OpenNebula Technology Days took place in Madrid in July. The event was attended by several partners that actively use OpenNebula as their core toolkit to build clouds. All in all, it turned out to be a successful and very formative event. This year OpenNebula was selected as a Google Summer of Code (GSoC) mentoring organization. We were very excited about this great opportunity to work with very talented and motivated students. During the summer, our students were part of our community and had the opportunity to learn the basics of virtualization, cloud computing and OpenNebula. During 2010, OpenNebula presented 30 keynotes, invited talks and tutorials in the main international events in cloud computing in 15 different countries. We have also continued and started collaborations with the main open source efforts and standards bodies. In May 2010, C12G Labs was created to provide the professional integration, certification and technical support that many enterprise IT shops require for internal adoption. OpenNebula.org is a project now managed by C12G Labs. This did not and will not change any of the objectives and core values of the project. C12G contributes to the long term sustainability of the project and is committed to maintain a fully open source technology and to enlarge the OpenNebula community . In line with our aim to develop the most-advanced, highly-scalable and adaptable software toolkit for cloud computing management, we are working hard on new features that will be available in the following months. Several exciting features are in our short term roadmap: an operations network to simplify the management of OpenNebula cloud instances, fault tolerance functionality to maximize uptime in your cloud, enhanced management of images and templates, new security functionality, enhanced support for federation of data centers and support for multi-tier architectures. Our goal is to get stable releases out more often so users can see progress more often, and our current plan is to have a three-month release cycle. These releases will concentrate on a new “big” feature and a collection of bug fixes and minor features. As a whole we think this will give a greatly improved user experience. In few days we will also announce the second edition of the OpenNebula Technology Days that will be organized in Brussels at the end of January, our participation in new large innovative projects, and our collaboration with leading IT companies in open-source and innovation in cloud computing management. If OpenNebula has become such a successful open source project, it is largely thanks in no small part to its community. We really appreciate your help in maintain OpenNebula’s position as the leading and most advanced open-source technology to build cloud infrastructures. As always, we appreciate our users feedback and welcome your comments on everything. The team will be monitoring this post for the next weeks or so and will try and answer all the questions we can. We’d also like to take this opportunity to wish you health, happiness and prosperity in 2011 to you and your loved ones! A couple of months ago our friends at Cfengine presented a brief overview of the possibilities of a Cfengine-managed OpenNebula setup at the Large Installation System Administration (LISA) conference in San Jose. The Cfengine team presented how Cfengine may be used on both the physical and virtual sides of an OpenNebula-based cloud. More specifically, they presented how Cfengine can be used to install and configure the physical infrastructure in an OpenNebula cloud, followed by the launch and configuration of generic virtual machine images that will run on top of that OpenNebula infrastructure. In a recent news article, Cfengine has announced that its Orion Cloud Pack, which was originally conceived to make the use of the Amazon EC2 Cloud simple for users of Cfengine, is also working on OpenNebula cloud instances. In July 2010 the StratusLab project conducted two surveys to collect requirements for the StratusLab cloud distribution and to understand the existing experience with virtualization/cloud technologies in Europe. Funded through the European Union Seventh Framework Programme (FP7), StratusLab is a two year project aimed to successfully integrate ‘cloud computing’ technologies into ‘grid’ infrastructures. The survey results are presented in project deliverable D2.1 Review of the Use of Cloud and Virtualization Technologies in Grid Infrastructures. The project conducted two online surveys, one aimed at system administrators and the other at users. Over two-thirds of sysadmins, and over three-quarters of users surveyed intend to use cloud. Perhaps more surprisingly, over one third of both groups are already using cloud technologies right now. The most popular public clouds are Amazon Web Services and Google App Engine, while OpenNebula is the most popular open source tool for cloud computing management. The StratusLab surveys have identified certain trends and requirements for cloud technologies among the Grid community that will be addressed to provide the first full cloud solution for grid and cluster computing. The StratusLab project aims to produce a toolkit to cloud-enable Grid infrastructures based on OpenNebula. The first version of its cloud computing distribution was released few weeks ago. I am happy to announce first release of the Python OCA bindings. These bindings wrap OpenNebula’s XML-RPC methods in the Python objects, which allows developers to interact with OpenNebula in a more pythonic way. Try it and share your thoughts, any feedback is welcome. C12G Labs announced today a major new release of OpenNebulaPro, the enterprise-ready edition of the OpenNebula Toolkit. OpenNebula 2.0 is the most flexible and innovative enterprise-class cloud computing tool for managing a data center’s virtual infrastructure. This fully open-source toolkit includes production-ready features for integration, management, scalability, security and accounting that many enterprise IT shops need for private and hybrid cloud adoption. OpenNebulaPro includes the most recent thoroughly tested and quality-controlled version of OpenNebula and tested software extensions from the community (ecosystem and addons catalogs) for its operation in business environments. OpenNebulaPro is provided under open-source license to customers and partners on an annual subscription basis through the new OpenNebula.pro Support Portal. The subscription model brings several additional benefits in terms of long term support, production-level support with professional SLAs, integration support for optimal and scalable execution in any hardware and software combination, certification support to validate compatibility with complementary components and customizations, regular updates and upgrades, and additional tools for the administration of OpenNebula cloud instances in production environments. C12G has created a new howto to explain the way to use OpenNebula with qcow images. Using them has the benefit of occupying less space, faster cloning time and solving problems related with sparse images. It is also a nice example on how OpenNebula behavior can be changed to suit the system administrator or infrastructure needs, in these case the storage model. There are still unexplored qcow feature besides the ones described in the text but it serves as the basis to implement them. 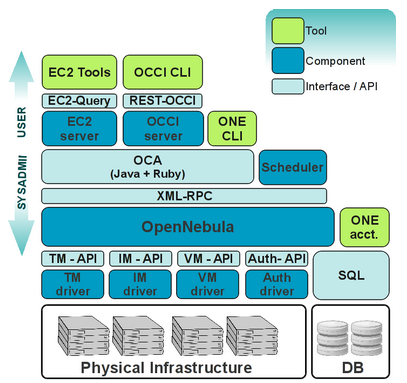 OpenNebula has been designed to be easily adapted to any infrastructure and easily extended with new components. The result is a modular system that can implement a variety of Cloud architectures and can interface with multiple datacenter services. In the new white paper OpenNebula APIs, C12G reviews the main interfaces of OpenNebula, their use and gives pointers to additional documentation for each one. Interfaces are classified in two categories: end-user cloud and system interfaces. Cloud interfaces are primary used to develop tools targeted to the end-user, and they provide a high level abstraction of the functionality provided by the Cloud. On the other hand, the system interfaces expose the full functionality of OpenNebula and are mainly used to adapt and tune the behavior of OpenNebula to the target infrastructure. The Management of Data Information, and Knowledge Group (MaDgIK) at the University of Athens focuses on several research areas, such as Database and Information Systems, Distributed Systems, Query Optimization, and Digital Libraries. During the past few years, projects within this group started offering and sharing hardware resources through a virtualized infrastructure. We eventually built our own IaaS-cloud using open source software, namely Xen, Debian and OpenNebula. However, that was not enough, since we needed custom solutions to suit our needs. At that point we called upon Eolus, the god of the winds, to blow and shape the clouds. Eolus is our open source attempt to join the forces of OpenNebula and Java Enterprise Edition. It is far from being an end product, yet it provides functionality that serves our purposes. In short, OpenNebula is used as a management tool for virtual resources that we exploit in building higher level custom services available through a JEE application container. An advanced VM scheduler called Nefeli and a web based administration console are only a couple of such high level components we offer to users. Our success stories include undergraduate theses, researchers and European funded projects (e.g. D4Science) experimenting and exploiting cloud resources. You can have a glimpse of our efforts, released under the EUPL licence, at https://code-projects.di.uoa.gr/eolus. A modified oned.conf to work out of the box with Debian. A tuned up onehost command which displays useful information for new OpenNebula users. A README file with an example session with OpenNebula, very useful for new users. Tested following the Debian policy. Thanks to ﻿﻿Łukasz Oleś for testing it under Xen! We have a strong commitment with this initiative and we plan to offer our support to keep this package up to date, especially with the upcoming OpenNebula releases. You can follow this packaging effort at the Alioth OpenNebula Project’s page, you can also clone the git repo or subscribe to the mailing list. OpenNebula 2.0.1 (codename Abell 39) Released! 3rd December, 2010. A month after the release of OpenNebula 2.0 the OpenNebula team is pleased to announce its first maintenance release. This update is the first in a series of stabilization updates to 2.0.0, coming regularly. OpenNebula 2.0.1 brings bugfixes and it is a recommended update for everyone running OpenNebula 2.0 or earlier versions. As the release only contains bugfixes, it will be a safe and smooth update for 2.0 users. OpenNebula 1.4 users may be interested in the following scripts to migrate to 2.0.1, contributed by Marlon Nerling. Better packaging of OpenNebula, including its integration in Debian unstable and improved rpm’s. Several minor bug fixes. Check the OpenNebula 2.0.1 issues for a complete list. Also you may be interested in the full list of changes introduced with OpenNebula 2.0, more details here. As usual for OpenNebula releases, this release is name after a nebula, in this case Abell 39 which is an spherical nebula about five light-years across, discovered by George Abell in 1966.
https://opennebula.org/wp-content/uploads/2018/11/opennebula_cloud_logo_white_bg-4.png 0 0 Ruben S. Montero https://opennebula.org/wp-content/uploads/2018/11/opennebula_cloud_logo_white_bg-4.png Ruben S. Montero2010-12-03 19:11:152010-12-03 19:19:09OpenNebula 2.0.1 (codename Abell 39) Released!